I’ve noticed a lot of writing interest in the new ‘Nottingham Eye’ recently – probably quite rightly as it is a huge and dominant current addition to the city landscape. It was a classic double-take I experienced when wandering down St. James Street and into the Old Market Square two Sunday evenings ago to be confronted by the huge construction in the latter stages of being erected . Here in Nottingham, people are well used to such sights of course. The annual Goose Fair invariably provides at least a brace of such rides come October each year and accentuates the night time view over the Forest site along with hundreds of other gaily-lit attractions. The Nottingham Eye however appears to completely dwarf even those huge fairground rides. 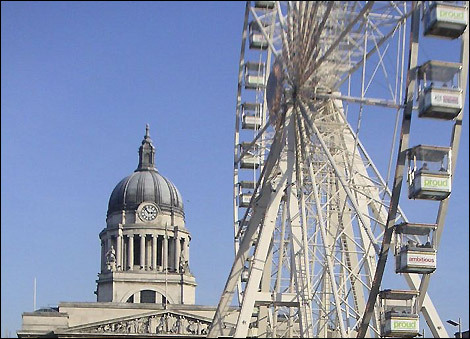 Read on and take a ride on the Nottingham Eye! It’s not too long since the Old Market Square, Slab Square to local folk, was completely refurbished. The work was interminable and it was frustrating to see the the bland builders boards surrounding what had become a long-term building site. The original square employed a ‘processional way’, basically a sunken walkway and centre to the old square. Attractive I, and no doubt many others believed with it’s seating, pretty flower beds and traditional fountains. The local council however decided that the original design from the 1930s’ was no longer practical enough for events and gatherings – a reasonable point of view. What emerged Lazarus-like was a brand new square with a much more levelled and simple design complete with modern water features. So now the main focus is to provide something of a calendar of events for the new ‘venue’. Just recently over the midwinter period a two-thirds size outdoor ice rink was erected and appeared to be a big success. Accompanying it was the now-traditional German Market, this time with stands that offered excellent German beer and Glühwein to wash down down tasty German sausages whilst watching the skater careering around the ice. That space has now been taken by the Nottingham Eye with it’s gondola rides or ‘flights’ as termed by the official site, at five pounds a time. The old ‘entertainment’ in the original square always left a little to the imagination I always felt. In what was an attractive city setting, the almost constant, garish and cheap-looking fairground rides and concessions which seemed to always be there, littering the square spoiled the look of the city’s crown jewel and centrepiece, but hopefully no longer. I’m not necessarily convinced about the type of view that will be offered from the zenith of the Nottingham Eye. Perhaps Nottingham, as interesting as it can be, is not the most dramatic city landscape, but all the same I’ll surely be handing my five pounds over to take a new and unique peak at the old city’s skyline along with many others. TAKE A FLIGHT ON THE NOTTINGHAM EYE! I saw the Nottingham Eye from the sky as I flew into East Midlands yesterday! I never saw the old version of Market Square, and I know that a lot of people don’t seem to like it, but I do! I like the fountain, and I loved the German market. Mmm.. bratwurst. But I can’t say I really understand the “Nottingham Eye.” As an outsider it seems every British city has one, and I guess I don’t see the point, especially in small and boring cities like Nottingham. You pay your admission, get up there, and what is there to see? Well, like yourself I’m not particularly convinced either. I did note that when the wheel arrived there was ‘Cardiff’ wording all over the gondolas! I think anyone expecting to see a great view from up there may be a little disappointed. I see it as a fairground ride basically. In that respect it’s ‘ok’.